Boston is a patriotic, all American city with a rich history and a vast selection of iconic landmarks. It’s packed with culture, with many museums, art galleries and theatre shows. Foodies will be in their element in Boston as there is a huge culinary scene; the city is home to some of the country’s best restaurants. 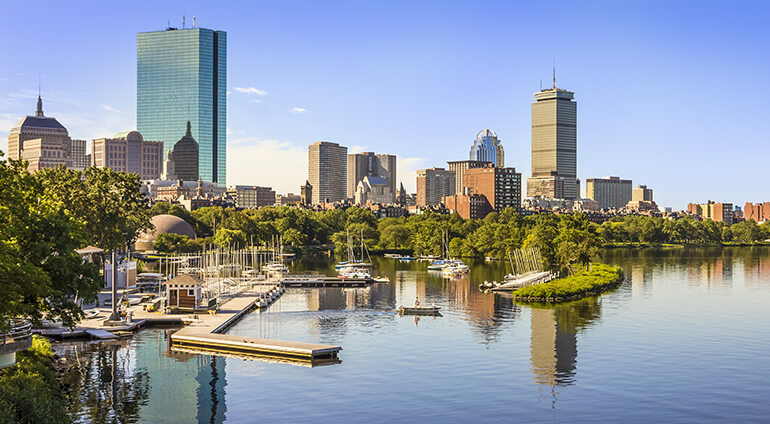 Boston is often described as the ‘Athens of America’ because of its rich heritage and impressive sights. Here you will find lots of students and young urban professionals. There’s also a huge Italian scene in Boston with lots of Italian families. Those looking for a holiday destination with great nightlife will enjoy some fantastic nights out in Boston. There are plenty of chic bars and clubs to keep you going until the early hours. To describe Boston as a city filled with sports enthusiasts is an understatement, Bostonians are extremely passionate about their sport. Be sure to catch a big game during your visit, as Boston is home to a lot of major pro sports teams. Express your inner culture vulture in Boston and uncover all the amazing things the city has to offer. This modern city is forward thinking, vibrant and cultured, managing to blend both old and new. From Georgian-style houses to towering skyscrapers, Boston blends modern and traditional style. Watch sports, shop until your drop, see the sights and dine in style in this alluring American city.